Starting from 12th October to 13th January at the Manx Museum Douglas, Isle of Man, is a new Knox exhibition, “Archibald Knox – Artist, Designer and Teacher”. Some of his best silver, jewellery, clocks, watercolours and illustrations will be on display. Loan items from The Peartree Collection will include this rarely seen pair of 1900 Liberty Cymric vases. 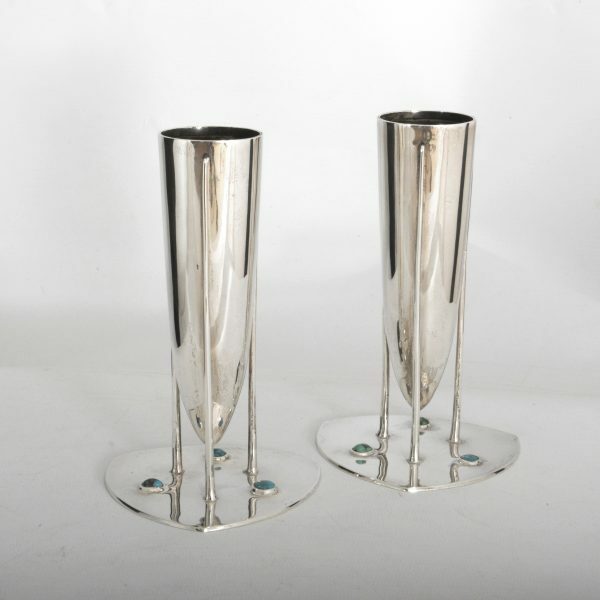 Liberty & Co Cymric silver and turquoise vases, the medium height example. Hallmarked Birmingham 1902, by Archibald Knox. This is one of the larger vases of this design and represents Knox modernist style as early as 1902.